Hi everyone, welcome to another Dispomed video. Today, we are going to talk about the differences between the standard Y circuits and the Coaxial circuits. Everyone is familiar with the standard Y circuits. The Y circuit has two independent connections: one for inspiration and another for expiration. Both of them are 22-mm connectors. It attached to those two connections. Around 1990, veterinarians started to use the circuits called Universal F circuits. Universal F circuit is used on the human market. It consists of a tube within a tube. One connection goes to the inhalation port and the other one, to the exhalation port. 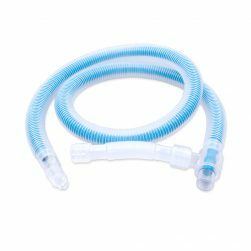 The inhalation travels through the center tubes up to the patient. One of the advantages of the Universal F circuit is that when the patient exhales, the warmer exhaled gas partially preheats the inhaled gas. Also, this heat exchange causes a better humidification of the circuit. We got curious to find out why they want to use this so we started measuring the breathing resistance and functionality of this circuit. We found out to be a very nice circuit to work with. However, we found out that when the patient exhales and the gas changes direction, it increases breathing resistance. So compared to the Y breathing circuit, the Universal F circuit has a much higher breathing resistance. It is not dangerous for the animal, however, the best thing to do is have a circuit with the lowest breathing resistance as possible. So, we tried to find a way to keep all the advantages of the Universal F circuit without its inconveniences. Another disadvantage of the Universal F circuit is that it is very possible to inadvertently connect the circuits on the wrong ports. If you do this, you lose all the advantages of a better heat recuperation and a better humidification. What we did is we have worked on a concept where we have all the advantages of the universal F circuit. 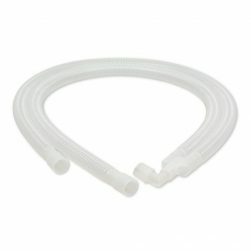 We designed a tube that had both connections going straight out of the tube. Rather than having a connection with the T on the side, we have put them straight out. We have the inspiratory port over here and the expiratory port over here. What this effectively does for us is we have the same advantages as the universal F circuit but we have the breathing resistance of the standard Y circuit. The other thing is it is impossible to misconnect the tube as there is only 1 connection on the machine. Expiratory here and inside is the inspiratory connection. You just slide the port on here. 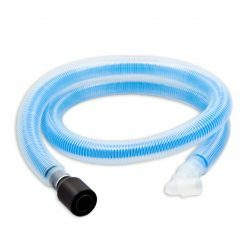 This circuit is available on several of our Moduflex™ line of anesthesia machines. Thank you for watching another Dispomed Video!